Guido of Siena, also known as Guido di Graziano, was an Italian Byzantine style painter of the 13th century. He may have made significant advances in the techniques of painting, much as Cimabue much later accomplished. We know nothing of the life of this painter whose name appears in the inscription on a large altarpanel, the Majestas formerly in the basilica of St. Domenic in Siena and now in the Palazzo Pubblico. painted in happy times by Guido da Siena whom merciful Christ afflicted with no suffering — 1221). He collaborated with Dietisalvi di Speme. On top of the painting Christ Blessing and Two Angels are represented. In thirteenth-century Siena several lay organizations existed whose members regularly attended masses, participated in religious processions, prayed together and sang hymns or "laude". One kind of confraternities, the "Laudesi" took their name from their custom of singing laude. These were frequently written in honour of the Virgin and Laudesi companies therefore often used a painted image of the Virgin and Christ Child as a focal point of their collective act of singing. The most imposing examples of thirteenth-century Sienese paintings that survive today have been associated with them, including Guido da Siena's panel painting of the Virgin and Christ Child Enthroned, which is the only certain work of the artist. The picture bears the date 1221. but this has been the subject of much controversy as stylistically the painting seems to belong about half a century later. It has been suggested that the inscription may have some commemorative purpose, the significance of which is now lost, rather than being a record of the date of execution. Although the painting is majestic in effect and follows Byzantine conventions of iconography, the figures are more natural in posture, to some extent relaxing the stiff linear patterns which had been conventional in central Italian painting up to that time. The throne too is set in a deeper picture space, which adds to the realism of the figures. On the basis of this picture a number of other panels, most of which are in the Siena Pinacoteca, have been assigned to Guido or his school. Despite his great obscurity, he is regarded as sharing with Coppo di Marcovaldo the honour of founding the Sienese School. The first Sienese painter whose name is known to us is Guido da Siena, who was active in the second half of the thirteenth century. This does not mean that there were no native-born painters working in Siena before this time. Indeed, there is a large group of panel paintings by anonymous artists which attest to the fact that early in the thirteenth century, if not actually in the late twelfth cenutry, Siena already had a lively tradition of painting, but its style was not yet distinct from that of other centers in Tuscany and the Umbrian-Roman regions. The oldest extant paintings are three Crosses-in the church of San Pietro in Villore at San Giovanni d'Asso, in the Museum of Religious Art in Montalcino, and Cross No. 597 in the Gallery of Siena — and these indicate that it is the school of Spoleto in Umbria rather than Lucchese or Pisan painting which has influenced the Sienese style. This is seen particularly in the choice of delicate colors, the extensive use of blue, as well as in the motif of Christ alive on the cross (Christus triumphans). 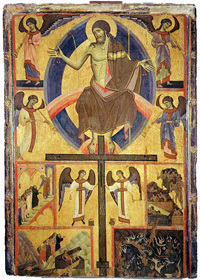 The celebrated Cross in the Cathedral of Spoleto is the source for the three Sienese examples and is signed and dated by Alberto Sotio in 1187. Among other panels of the same period is the Altarfrontal dated 1215 (the oldest Sienese painting which can be dated with certainty) from the Ardenga Abbey and now in the Siena Gallery, and the Madonna formerly in the Cathedral and now in the Museum of the Cathedral, Siena. These examples are proof of the fact that Sienese painting did not develop as an offshoot of the Tuscan tradition but rather was rooted in the Umbrian-Roman school. Nevertheless, this trend, which was absorbed without significant change, though with a certain form and refinement in the course of its evolution during the Italian Romanesque, was completely transformed by the new wave of Byzantine style which first nurtured the art of Pisa which had the closest contacts with Byzantium, and shortly after the middle of the thirteenth century reached Siena. In Pisa, this style is best seen in the art of Giunta Pisano. It is that style which Vasari and other historians called the "Greek manner," and its most typical, if not its most accomplished and outstanding, exponent is Guido da Siena. Enzo Carli , Sienese Painting, p.15, New York Graphic Society, Greenwich, 1956. This article uses material from the Wikipedia article Guido da Siena and other Wikipedia articles and is published under the GNU Free Documentation License.